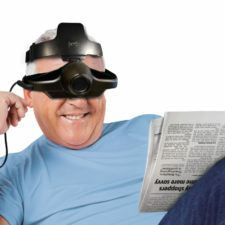 Jordy is a hands free distance and close focus wearable magnifier in the form of low vision glasses. Some have called Jordy “Macular Degeneration Glasses”. Jordy low vision glasses are a battery-operated wearable magnifier with a pantoscopic tilt. Jordy glasses can also be used as two low vision systems in one. 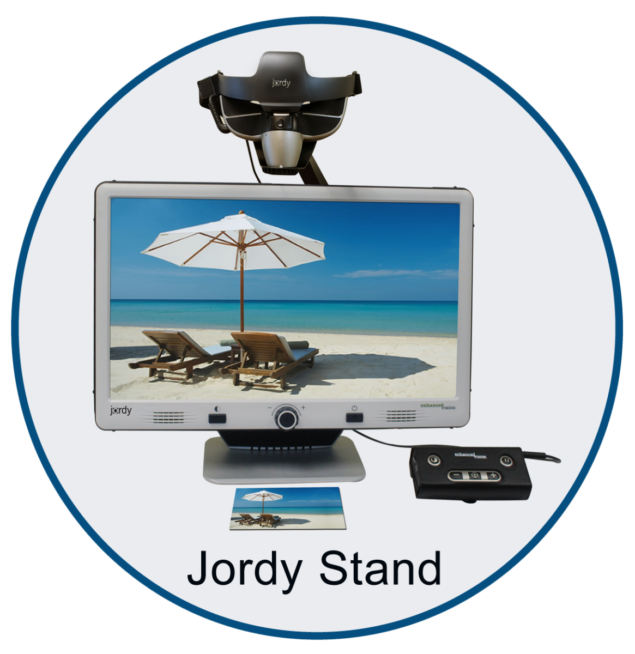 Jordy can be worn like a pair of glasses to see near, far, & everything in between or mounted to the optional docking stand turning the Jordy into a Desktop video magnifier. 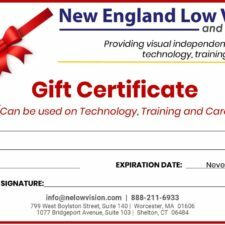 This low vision aid is perfect at work, home, school, at your and anywhere on the go! 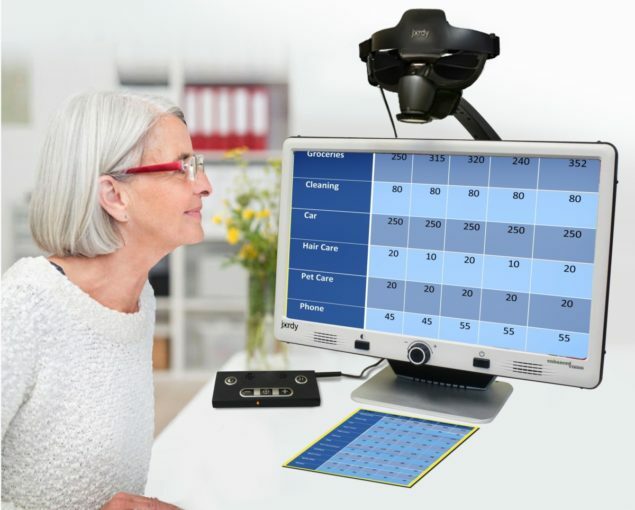 Jordy’s innovative system is the ideal solution for people with Macular Degeneration and other types of vision loss who enjoy an active lifestyle. 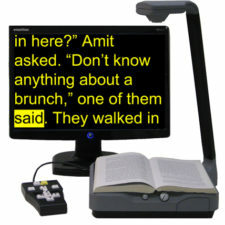 Jordy low vision glasses can help you to read, write, and see in any environment including work, home, and school. Jordy is a battery-operated, full-color portable system that can be worn like a pair of glasses to see near, far, and everything in between. 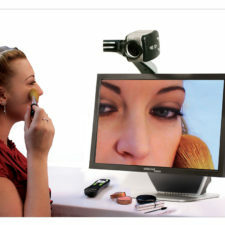 Jordy becomes a fully functioning HD desktop video magnifier when placed on its optional desktop 24” monitor docking stand. 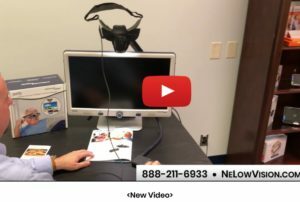 The Jordy Docking Stand “training mode” allows for the client/patient to see the image through the Jordy glasses and for the dealer/prescriber to see where the client/patient is looking at on the docking stand display. Previously the on screen messages were not visible on both displays. We have now added the ability to see the on screen messages on both the Jordy docking stand monitor AND the Jordy head worn device. 1) Front Panel Software Update Function. This does not affect the performance of the product in any way but rather allows for easier future software updating in the event Enhanced Vision upgrades the product further. 2) Improvement in power consumption. When the Jordy Docking Stand is in standby mode, the power consumption is less which will help decrease household electricity bills. 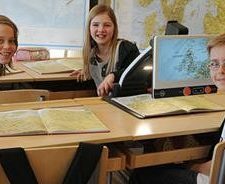 For more information, question and answers, and how to upgrade your Jordy Docking Stand, please <click here>.